Museums [музеї; muzei]. Institutions for art objects, antiquities, and other cultural goods that have been divested of their sacred and functional qualities. 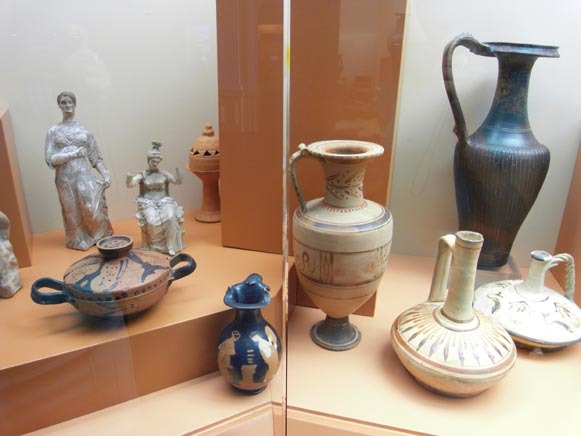 In museums they serve the secondary purposes of preservation, classification, and education. Private collections are the most reliable sources for replenishing damaged or destroyed museum collections. Ukraine before Soviet rule. In the period of Kyivan Rus’ valuable private collections belonged to the Kyivan, Galician-Volhynian, and appanage princes. The only artifacts that could be seen by the general public were the artworks gracing cathedrals and monasteries and those held in sacristies. Many churches in Ukraine amassed large collections of artifacts. The sacristies of the Saint Sophia Cathedral, the Kyivan Cave Monastery, the Saint Michael's Golden-Domed Monastery, and the Cathedral of the Transfiguration in Chernihiv are known to have contained priceless collections. Incursions by nomadic tribes and internecine fighting among the princes caused considerable damage to those holdings. Also, much was lost during the sacking of Kyiv by Andrei Bogoliubskii in 1169. The greatest losses were sustained during the Mongol-Tatar invasions of the 13th century, which only individual artifacts survived. They are still being found in archeological excavations. Some are housed in Russian and other museums. The Polish-Lithuanian state-sponsored private collections suffered a similar fate. In the 14th to 17th centuries countless ornamented implements and artworks (probably similar to those of Western Europe) were assembled in the castles of magnates and on the estates of lords. Many of them were destroyed in the uprisings of the mid-17th century. For subsequent times, lists of holdings in the collections of various palaces, including paintings, furniture, and decorative tableware, are extant. Diaries of Ukrainian Cossack officials also catalog their acquisition of jewelry and folk musical instruments. The renewed accumulation of artifacts was a reflection of the Ukrainian national and cultural revival in the 18th century. The most distinguished patron of the time was Hetman Ivan Mazepa. Russian-ruled Ukraine. In the late 18th century a numismatic collection already existed at the Basilian school in Uman (eventually transferred to the Kremenets Lyceum). In 1809 an archeological collection was opened at the Hydrographic Bureau in Mykolaiv. Similar museums were opened in Teodosiia (1811), Odesa (1825), and Kerch (1826). Of them the Odesa Municipal Museum of Antiquities had the most valuable collection; it later became the first public museum in the Russian Empire (see Odesa Archeological Museum). Formal schools of museology were established in the late 18th and early 19th century. Maksym Berlynsky, Kindrat Lokhvytsky, and Mykhailo Maksymovych were central figures in the development of museums in Kyiv. The first to be established was the Archeological Museum at Kyiv University (est 1835). Part of its exhibitions were formed from archeological digs conducted by Lokhvytsky, Volodymyr Antonovych, Mykola Ivanyshev, Dimitrii Samokvasov, O. Stavrovsky, and Ya. 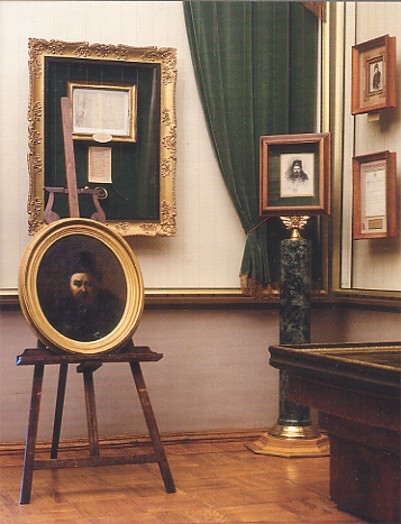 Voloshynsky; the collection of the archeological museum of the Higher Courses for Women was donated to it in 1916. The Numismatics Cabinet was opened in the university's library in 1835 (overseen by Antonovych in 1872–1908), with its exhibits drawn from the collections of the Kremenets Lyceum and Vilnius Lyceum. 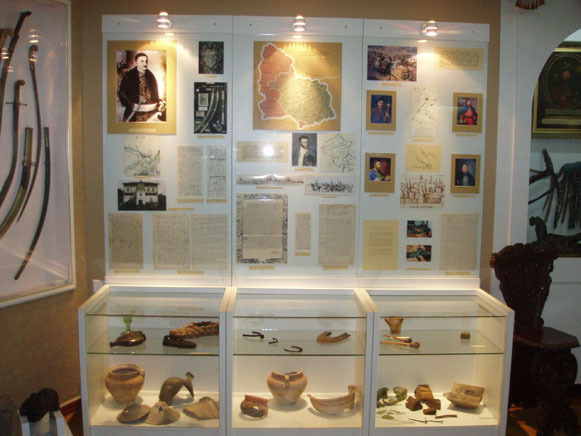 The Church-Archeological Society at the Kyiv Theological Academy organized a museum (see Kyiv Museum of Church Antiquities), headed by Mykola I. Petrov, with a large and valuable collection of artifacts (approx 20,000) in 1872. The collection included Palestinian and Cypriot treasures (gathered by Archimandrite A. Kapustin), Byzantine icons of the 4th to 15th centuries, particularly encaustic icons (Bishop P. Uspensky), eastern shrines (A. Muravev), and church relics (M. Leopardov). Similar societies in Chernihiv, Kamianets-Podilskyi, Poltava, and Zhytomyr founded treasuries of antiquities from the local eparchies. Priceless collections of icons, old manuscripts (see Paleography), tapestries, coins, archeological artifacts, and folk art were assembled by the Shevchenko Scientific Society (founded in 1873, its collection opened as an independent museum in 1914), the Stauropegion Institute (founded in 1788, its collection opened as a museum in 1889), and the National Museum in Lviv (reorganized in 1908 from the church museum of Metropolitan Andrei Sheptytsky). These collections were also displayed in museums in Peremyshl, Chernivtsi, and Ternopil. 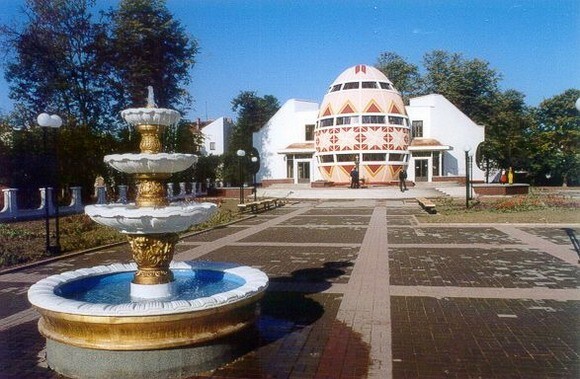 Independent museums were organized in central Ukraine by various groups of enthusiasts, community institutions, and local administration officials. Among them were the Museum of the Odesa Society of History and Antiquities (founded in 1843, based on the municipal museum), the Yelysavethrad Museum at the Realschule (1883), the Historical Museum of the Chernihiv Scientific Archival Commission (1896) (see Chernihiv Historical Museum), and the Volhynian Museum (1900, founded by the Volhynia Research Society) (see Zhytomyr Regional Studies Museum). 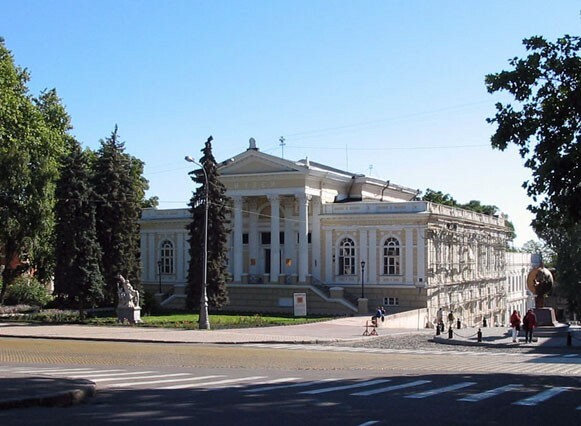 The Kyiv Museum of Art and Industry was founded by the Society of Antiquities and Art in 1904, with the collections of O. Bobrynsky, K. Bolsunovsky, Bohdan Khanenko and V. Khanenko, S. Mazaraki, M. Tarnovsky, and S. Znosko-Borovsky. The Kyiv Society for the Preservation of Ancient and Artistic Monuments (est 1910) was active throughout the central gubernias. As well, private collectors devoted considerable effort to establishing museums, including Vasyl V. Tarnovsky in Chernihiv (the museum opened in 1901, with exhibits relating to the Cossack-Hetman state), Oleksander Pol in Katerynoslav (1902, reorganized as a museum of Zaporozhian Cossack history by Dmytro Yavornytsky), B. and V. Khanenko (1919, the Bohdan and Varvara Khanenko National Museum of Arts), V. Babenko in Vovchansk (1911, artifacts from his archeological digs), and K. Skarzhynska in Lubny (folk art). During that time many unique and valuable artifacts, including Scythian art and ancient treasures (see Greek art), Cossack standards, and items from Ivan Zabelin's excavations, were transported en masse to imperial holdings in Saint Petersburg and Moscow. Western Ukraine under Austrian rule. Exhibits were opened of the collections of the Lubomirski (1823) and Dzieduszycki (1871) families, and the first public archeological exhibition in Lviv was held in 1861. In the 1870s an endowment was established for the first Ukrainian museum at the People's Home in Lviv, and it was formally opened in 1901. The Lviv Pharmacy Museum, located in the three-story premises of the original pharmacy (est 1735) on Rynok Square, is one of the city's oldest extant museums. Ukraine under Soviet rule. The Revolution of 1917 brought about vast changes in the way private and community cultural goods were preserved. It resulted in the massive destruction of countless ornamented implements from aristocratic estates, religious items, and peasants' tools. A considerable share of individual artifacts and collections held privately (eg, by Mykhailo Hrushevsky, Vasyl H. Krychevsky) was lost. Ukraine also lost various items of Polish origin as a result of the Peace Treaty of Riga between the USSR and Poland. The Soviet Ukrainian government in Kharkiv created the All-Ukrainian Committee for the Preservation of Ancient and Artistic Monuments (1919), with sweeping powers at the county, raion, volost, and village levels, in order to nationalize all museums, private historical and art collections, public monuments, and other cultural and scientific treasures. The stated purpose of ‘systematizing cultural property and preventing its theft, destruction, or exportation’ was in fact a pretext that allowed the committee itself to steal, destroy, and export: museum funds were plundered, campaigns of expropriation of church valuables were conducted (1922), public burnings of icons were held (1931), and priceless artifacts from museums were sold abroad for foreign currency. Many items also disappeared during the course of the transfer and reorganization of institutions. The efforts of Ukrainian museum officials, such as Fedir Ernst, Danylo Shcherbakivsky, and Stefan Taranushenko, rescued many collections from destruction. The Tereshchenko and Hansen family collections were the foundation of the Kyiv Picture Gallery (1922; see Kyiv Picture Gallery National Museum), and the Branicki family holdings went into the Bila Tserkva Archeological and Ethnographic Museum. Other artifacts provided the basis for the Sumy Art Museum (1920, drawn largely from O. Hansen's collection), the Konotop Regional Museum (1920, drawn from Stepan Ponomarev's collection), and other regional studies museums. Ukrainian museum development reached its zenith in the 1920s. The country's museums consolidated, organized, and exhibited perhaps the finest examples of Ukraine's cultural heritage. 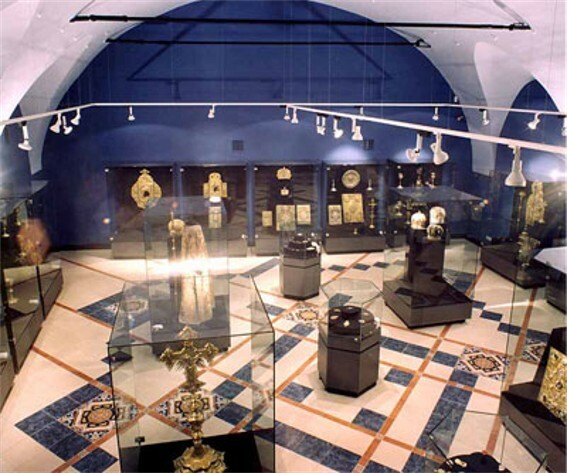 In 1923 the Kyiv Museum of Church Antiquities was transferred to the Kyivan Cave Monastery, and the collection of the Numismatics Cabinet at Kyiv University was used to establish the holdings of the All-Ukrainian Museum Quarter's numismatic department. A new category of museum came into being, the Museum of the Revolution, with the express purpose of explaining and propagandizing the history of communism and the revolutionary movement. In 1926 the All-Ukrainian Museum Quarter was established on the site of the Kyivan Cave Monastery, was later reorganized as the Kyivan Cave Historical-Cultural Preserve (director, Petro Kurinny). The site housed the Lavra Museum of Religious Cults and Folkways, the Museum of Architecture, the Potocki Museum of Ukrainian Antiquity, the VUAN Theater Museum (see Museum of Theater, Music, and Cinema Arts of Ukraine), the Museum of Archeology of the Cabinet of Anthropology and Ethnology of the VUAN (see Museum of Anthropology and Ethnology), the All-Ukrainian Restoration Workshop, and the archives and library of the monastery. The monastery's shrines and churches were also opened as museums. A Party commission oversaw the return of many artifacts which had been taken to Russia. In 1927 the academic journal Ukraïns’kyi muzei began publication. The role of a national Ukrainian museum was assumed by the All-Ukrainian Historical Museum, founded in 1924 with the collections of the Kyiv City Museum of Antiquities and Art (director Mykola Biliashivsky). 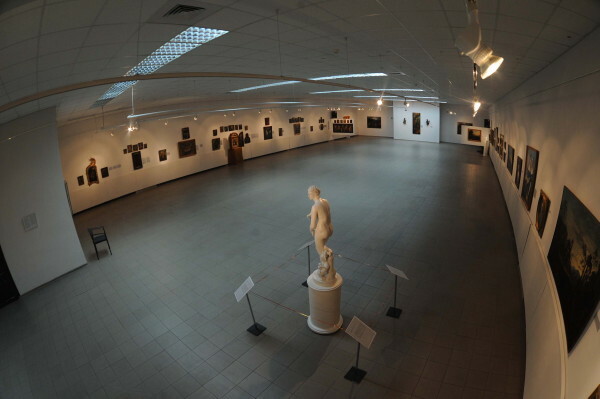 Other prominent museums included the Kharkiv Museum of Ukrainian Art (see Kharkiv Art Museum), founded on the basis of the collection of the Museum of Church History (director, Stefan Taranushenko), and the VUAN Museum of Ukraine's Figures in Scholarship and Art (custodian, Ye. Rudynska). In the Stalinist terror of the 1930s all the aforementioned institutions, as well as a substantial number of lesser ones, were liquidated, and their employees were persecuted and arrested. On 25 September 1937 Pravda (Moscow) reported that more than 20 museums had been looted, their holdings sold, and an untold number of priceless artifacts destroyed. Among the institutions that perished was the Museum of the Myrhorod Ceramic School, which had been active for 35 years and had amassed an impressive collection of European and Asian ceramic works. 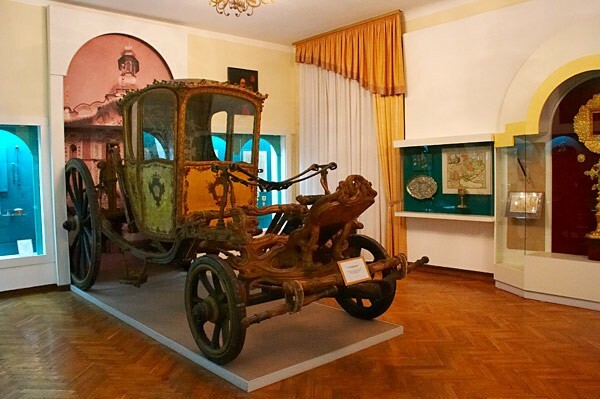 The Museum of Agriculture in Kyiv was despoiled, as was the Tarnovsky Collection in Chernihiv and the Potocki Museum at the Kyivan Cave Monastery. The Museum of Archeology and History in Odesa (see Odesa Archeological Museum) was closed. The fate of the collections of the museums in Cherkasy, Shepetivka, Zvenyhorodka, Kupiansk, and Nizhyn is unknown. During that period exhibitions in museums were created to illustrate basic Marxist-Leninist dogma (see Marxism-Leninism) and to serve as antireligious propaganda. Special ‘antireligious museums’ or ‘museums of atheism’ were established in churches and shrines, the largest of them in Saint Volodymyr's Cathedral in Kyiv and in the Poltava Art Museum. Original artifacts were removed and were replaced primarily by displays of diagrams, quotations, and slogans written in huge letters. Virtually all of the museums in Ukraine lost their true character as depositories of valuable cultural and historical property. Of the 120 museums which existed during 1917–32, 95 remained: 13 museums of the Revolution, 6 historical museums, 46 regional studies museums, 16 art museums, 7 literary memorial museums, 3 antireligious museums, and 1 museum of Hebrew culture. Ukrainian materials were virtually excluded from exhibits, or (as in the case of art museums) they were displayed only alongside Russian materials, with a heavy preponderance of the latter. Among museum employees only a few were Ukrainian. Ukrainian cultural property suffered incalculable and massive damage during the Second World War. Artifacts were evacuated into the depths of the USSR, or detonated in booby traps set by the retreating Soviet Army and security organs, or confiscated or destroyed by the German occupational forces. Among the museums annihilated outright were the Archeological Museum and the Museum of Slobidska Ukraine in Kharkiv and the Poltava Art Museum. Interwar Western Ukraine and the émigré community. Ukrainian museums were maintained systematically and continued to develop in interwar Western Ukraine. Central to the effort was the work of Ilarion Svientsitsky, the director of the National Museum in Lviv. Western Ukrainian scholars established a network of regional studies museums, encompassing the Hutsul region (in Kolomyia, est 1926 by Volodymyr Kobrynsky), Boiko region (in Sambir, est 1927 by V. Kobilnyk), Lemko region (est 1930, see Lemkivshchyna Museum), and Sokal region (in Sokal, est 1937 by B. Chaikovsky). In Prague Dmytro Antonovych was the director of the Museum of Ukraine's Struggle for Independence, founded in 1925. Its holdings included diplomatic and military material, as well as material on the history of the Ukrainian emigration. The collection was transported into the USSR after the Second World War. 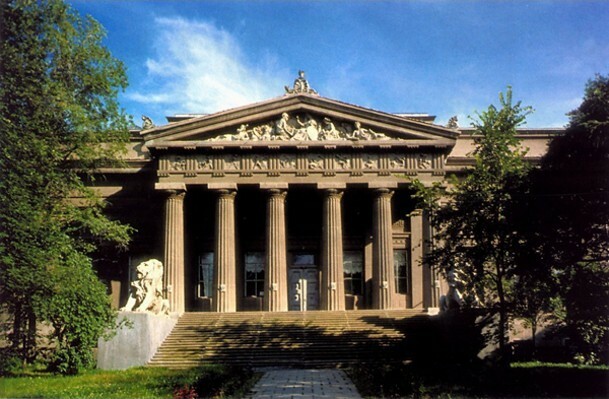 In 1952, 1,743 exhibits of the National Museum (including paintings by Heorhii Narbut, Mykhailo Boichuk, Petro Kholodny, and Pavlo Kovzhun, as well as sculptures by Alexander Archipenko) were destroyed at the spetsfondy of the Lviv Scientific Library of the Academy of Sciences of the Ukrainian SSR. Postwar Soviet Ukraine. Whereas in 1940 there was a total of 174 museums in Ukraine (counting the ones nationalized when the Soviets invaded Western Ukraine), only 119 museums survived the war. By 1950 their number had increased to 137 (compared to 542 in the RSFSR, 937 in the USSR). Newly established museums were for the most part named after events or figures of the ‘Great Patriotic War.’ As in the fields of history and historiography, exhibits concentrated on recent years and decades (eg, the Exhibition of Economic Achievements of the Ukrainian SSR) and treated earlier periods in a cursory or distorted fashion. All museums came under the jurisdiction of the Administration of Museums and Preservation of Cultural Landmarks, an organ of the Ministry of Culture of the Ukrainian SSR. Among them were nearly 1,000 ‘people's museums,’ supposedly maintained and staffed entirely by volunteers, which were supervised by local Party and Soviet organizations. Museums in postwar Soviet Ukraine had several common characteristics: (1) they were headed by Party functionaries who knew little or nothing about the material they oversaw; (2) their budgets and salaries were miserly, the result being a scarcity of qualified workers (especially in art restoration) and an extremely high rate of turnover; (3) their collections were housed in poorly maintained structures, often entirely unsuited for conservation and exhibition; (4) they contributed to the repression of Ukrainian culture by confiscating artifacts, rewriting history, and serving as propaganda vehicles for the state; and (5) their holdings (particularly the Lviv museums, the National Kyivan Cave Historical-Cultural Preserve, and the Lubny Regional Studies Museum) were often misappropriated by directors and employees out of various motives (for personal gain, or in the interest of preserving certain artifacts). Nevertheless, a few notable museums emerged in Ukraine in the 1960s to 1980s, including the Museum of Historical Treasures of Ukraine, the Museum of Kyiv’s History, and the Pereiaslav-Khmelnytskyi Historical Museum. In 1988 there were 201 museums in the Ukrainian SSR (compared to 1,130 in the RSFSR, 2,207 in the USSR). According to official attendance figures the most popular museums were in Kyiv—the award-winning Saint Sophia Museum, the National Kyivan Cave Historical-Cultural Preserve, the Central Scientific Natural History Museum, the Ukrainian State Museum of the History of the Great Patriotic War, and the branch of the Central Lenin Museum—and in Sevastopol—the Museum of the Heroic Defense and Salvation of Sevastopol and the Aquarium-Museum. The number of objects (in millions) inventoried in Ukrainian museums increased from 3.6 in 1970 (30 in the RSFSR, 43 in the USSR) to 5.6 in 1980 (35, 56) and 8.1 in 1987 (41, 68). The number of employees working in Ukrainian museums increased from 3,950 in 1970 to 8,700 in 1980 and 10,750 in 1987. It is noteworthy, however, that the floor space officially allotted to museums in Ukraine decreased by over one-half (2.1 million sq m in 1985 to 1 million sq m in 1987), whereas it increased in every other Soviet republic during the same period. The proportion of floor space in Ukrainian museums allocated for exhibition space (25 percent vs 35–65 percent elsewhere in the USSR) and storage space (5 percent vs 8–18 percent) was lower than in all other Soviet republics (except the Tadzhikistan). The West. Ukrainian museums of various kinds, organized by scholarly, religious, and community groups, are to be found on every continent where Ukrainians live. Among the most notable are the Ukrainian Cultural and Educational Centre (Winnipeg), the Niagara Falls Art Gallery and Museum, the Ukrainian Museum of Canada, the Ukrainian Museum (New York), the Ukrainian Museum-Archives (Cleveland), the Ukrainian National Museum (Chicago), the Ukrainian-American Archives, Museum, and Library (Detroit), the Petliura Ukrainian Library (Paris), and the Svydnyk Museum of Ukrainian Culture. An exhibition of Ukrainian ethnography was opened at the Canadian Museum of Civilization in Ottawa in 1991. Many Ukrainian exhibits are also to be found in Poland, in the Silesian Museum in Wrocław, the Poznań and Warsaw ethnographic museums, and the Polish Military Museum in Warsaw.